For our interview series “Five Questions - Five Answers”, Dr. Ely Karmon, Senior Research Scholar at The International Institute for Counter-Terrorism (ICT) and Senior Research Fellow at the Institute for Policy and Strategy at The Interdisciplinary Center (IDC) in Herzliya, Israel, elaborates on the prospects of the current Israeli-Palestinian peace negotiations. Dr. Karmon, thank you very much for taking your time to answer some questions. In a recent Jerusalem Post article you explained that the current political situation is beneficial to negotiations. Can you elaborate on this? In my recent Jerusalem Report article I argued that there is now a window of opportunity to advance the present Israeli-Palestinian peace negotiations because Hamas, the main opponent to the process, is weakened in the internal Palestinian camp, especially in the Gaza Strip, and isolated on the regional arena; the Tehran regime has to be more cautious and less aggressive in the regional arena during the sensitive period of the implementation of the Geneva nuclear deal with the U.S. and the Western powers and as such to restrain itself from supporting militarily the Hamas. The military regime in Egypt is working on isolating Hamas because of the negative influence the Islamist movement has on the Egyptian arena by its political and operative cooperation with the Muslim Brotherhood and the jihadists in the Sinai; at the same time Egypt is supporting politically the Palestinian Authority’s (PA) leadership. The idea would be to impose PA control over Gaza, with the support of Egypt, divide the Hamas movement by giving the more pragmatic Hamas leaders (outside the framework of the Hamas movement) incentives to be part of a new joint PA regime, and by offering the Palestinians in the West Bank and Gaza better economic and territorial conditions in the short-term, and, in the long-term, a clear compromise acceptable to all parties. Do you think an agreement between Hamas and Fatah would be an advantage for the negotiations? In my opinion any agreement between Fatah and Hamas will weaken in the end Fatah and the agreement would enforce more radical positions by the PA, like it happened in several occasions in the past. How, do you think, did the popular uprisings in the Arab world influence the decision of Israeli and Palestinian leaders to return to negotiations? The decision of Israeli and Palestinian leaders to return to negotiations was mainly the result of strong American, and in some measure European pressure. At the same time, the violent uprisings in the Arab countries, the massacres by the Syrian regime, the dire economic and social situation and the prospects for long-term instability in the region convinced the leaders, and also much of the public on the two sides that negotiations give some hope and can calm the situation in the West Bank, at least on the short term. In Israel as well as in Saudi Arabia and other Sunni states, the US have been criticised quite openly for not being tough enough in its stance on Syria and Iran. Could that have a negative influence on the negotiations? The perception by regional actors that the Obama administration has no clear Middle East strategy and is emerging weaker on the global arena as a result of its stance in the Syrian crisis and Iranian nuclear deal, will no doubt convince the Palestinian and Israeli leaders that they can resist further US pressure if their strategic interests are in jeopardy. What are your expectations for the current peace talks? Could you give us an outlook? In my opinion there is no prospect for a final agreement until the regional turmoil will stabilize, at least in Egypt and Syria, and as long as there is no compromise by the Palestinians on the issues of the right of return and Jerusalem (the issue of territory and borders is solvable I think). At the same time Israel should compromise on the issues of settlements and long term security prerequisites. Clearly, I present very general ideas which demand a much more detailed analysis of the heavy issues involved. A possible interim agreement on the short term would involve a full freeze of Israeli settlement building and some symbolic territorial modifications in the West Bank; Palestinian cessation of the anti-Israeli incitement and glorification of terrorism and enhanced security activity against potential violent and terrorist elements; a bilateral very general written framework for the future final agreement. The questions were asked by Michael Mertes and Evelyn Gaiser. 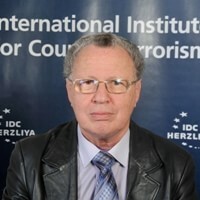 Dr. Ely Karmon is Senior Research Scholar at The International Institute for Counter-Terrorism (ICT) and Senior Research Fellow at the Institute for Policy and Strategy at The Interdisciplinary Center (IDC) in Herzliya, Israel. 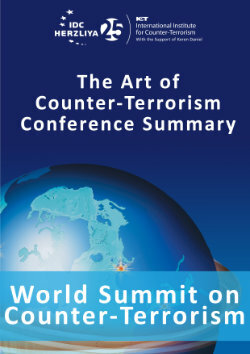 He lectures on Terrorism and Guerrilla in Modern Times and CBRN terrorism at the M.A. Counterterrorism Studies at IDC. Dr. Karmon holds a B.A. in English and French Culture from the Hebrew University in Jerusalem, a License in International Relations from the Institut d’Etudes Politiques and a License in Bantu languages from the Ecole de Langues Orientales, in Paris. He earned his M.A. and Ph.D. in Political Science from Haifa University.